One thing the Lord has really been convicting me about recently is the need to have grace for others. The picture of Christ with his disciples comes to mind. Amazing to think that the Creator of the Universe came down to the level of 12 ordinary guys and worked with them, as a friend and rabbi, where each of them was. As I read the gospel accounts, I read about how he called them 'friends,' how he walked with them, cooked meals for them, talked about everyday issues with them (eg, paying tax); how he washed their feet. 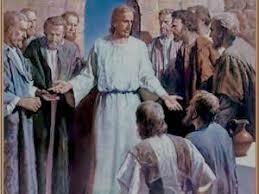 By the questions they asked, it is clear that Christ was tremendously approachable to them. By the ridiculous arguments they had among themselves (like which of them was the greatest - Mark 9:33-35) in Christ's presence, it's amazing how patient Christ was with them. Yes, the disciples had plenty wrong with them. Lots of specks, even lots of logs (Matthew 7:3). But these clearly aren't the things Christ focused on in them. No, Christ's relationship with his disciples was not one of accuser or 'fixer'; it was a relationship where the disciples felt unconditionally loved and affirmed. And in this form of relationship, through hours and hours and hours of eating and working and walking and living, Christ oversaw the gradual transformation of his chosen. And the fruits of his affirming discipleship are remarkable. Peter, for example, went from being a dopey act-first, think-later dude who made empty promises and abandoned Christ when he was arrested in the Garden of Olives; Peter went from this to, through Christ's years-long discipleship (and through the Cross and the equipping of the Holy Spirit, aka 'the Comforter' incidentally) to one of the great apostles of the New Testament; a man of courage, action, leadership and faith. Yes, Jesus rebuked (eg, Matthew 16:23 - "Get behind me, Satan") and firmly exhorted (John 21 - "Feed my sheep"), and he required and expected much of his disciples, but the Lord Jesus was also an approachable friend, a patient mentor, an affirming teacher. What a challenge. Notch another one up for grace. This is the most helpful, bang on entry in this entire blog stream. Made ten times more powerful by the fact that it is evidently written by someone who is in the process of learning the very discoveries it presents. "More grace Lord! More tenacious, balanced disciplers! More kingdom growth through the loving relationships your Son modeled!"